Foldylock Compact Review: The lightest folding lock! Up until now, Abus have dominated the folding lock market. Not only did they invent this style of bike lock, they were also the only company that had their folding locks certified by Sold Secure, the most well established, independent testing house. And since I only recommend locks that have been tested and rated Sold Secure Silver or above, so far, I’ve only recommended Abus folding locks! However, there is a new folding lock in town! The Foldylock works in the same way as the Abus folding locks. But they’ve improved the user experience, so that in many ways it’s actually a better lock than the original. How so? Well, read on and I’ll tell you! I’ve been using the new Foldylock Compact for a couple of months now and in this review I’ll cover how secure it is and how easy it is to carry around and use on a daily basis. At the end I’ll also look at some of the alternatives in case it’s not quite best lock for you. How secure is the Foldylock Compact? The Foldylock Compact has been tested by Sold Secure and awarded a Silver rating. This should make it a good mid-security lock for lower risk circumstances. It also means that it offers more or less the same level of protection as the Abus Bordo 6000 folding lock. You get three keys with the Foldylock. Like most decent bike locks, they come with a code for ordering new keys. Unlike most other bike locks, these are internal cut keys (also known as “Sidewinder” or “Laser cut” keys. These types of keys are difficult to replicate and the mechanisms are difficult to pick. So this adds to the security of the Foldylock. However, folding locks are rarely as secure as comparable U-locks. The steel bars are thinner than U-lock shackles, meaning they are more likely to succumb to bolt cutters. And the pins than join the bars together are vulnerable to attack by both bolt cutters and drills. The bars on the Foldylock are 5 mm thick, making them the same thickness as the Abus Bordo 6000. And probably about as secure. But Foldylock claim to have made some adjustments to the pins so that the common mode of attack where the pins are sheared with bolt cutters is no longer possible. This is great news! But the thinner bars on all folding locks means that the Foldylock may still be vulnerable to large bolt cutters. Does this mean you should avoid the Foldylock in favor of more traditional U-locks? No, not at all! You just need to work out your risk levels. A Sold Secure Silver folding lock will offer more than enough protection for many cyclists whose risk levels are not so high. And since (as we’ll see), the Foldylock is so good in many other areas, it could still be a great choice for you. How easy is it to carry the Foldylock around? This is where folding locks really excel. And the Foldylock is no exception. In fact it’s actually even easier to transport than the Abus folding locks! The problem with traditional U-locks is that they have a rigid shape. 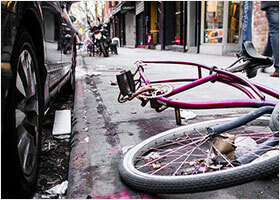 This means that when they’re attached to your bike frame, their center of gravity is away from the frame. And this makes it difficult to keep them securely in place as you ride around. They tend to rattle about, work loose and sometimes even fall off! Folding locks don’t have this problem. Since they fold down into a very compact package, once they’re in the case on the bike, their center of gravity is right against the frame. This means that not only are they much more visually discreet than U-locks, you’ll also have none of the transport problems you get with a U-lock. They won’t rattle, they wont work loose and they should never fall off! The Foldylock comes with a smooth, hard plastic case. The lock slides very easily into this case which is shaped in such a way that it clicks securely into place at the bottom. This means the case doesn’t need a strap to keep the lock secure, so it’s quicker and easier to add and remove the lock. Just like the Abus folding locks, there are two ways to attach the case to your bike. The easiest way is to screw the case into the holes which many bikes have on the the seat tube or down tube (for a water bottle holder). If you don’t have these holes (or if you’re already using them for a water bottle holder! ), then Foldylock provide two Velcro straps that allow you to fasten the case anywhere you can get them around your frame. Using the water bottle screws is definitely the best way to attach the case to your bike. It’s a lot easier and the case feels much more secure fastened in this way. Foldylock even supply the screws and a long hex key to make the job extra easy! Using the Velcro straps is more of a pain. The frame of my bike is quite thin. This means that there’s a lot of spare Velcro strap once it’s tightened around the seat or top tube. There’s no way to tuck this extra strap away, so it flaps about at the side of the case. Also, with a thin frame, less of the Velcro is actually stuck down which made me feel the case wasn’t quite as securely fastened. I had exactly the same problem with the Velcro straps that came with the Abus Bordo folding locks. And of course this is because the manufactures need to be sure that the case will fit thick framed mountain bikes as well as skinny framed racers! However, having said all this, although it’s a bit annoying, I never had any problems with the case working loose or moving about when it was fastened with the Velcro straps and there’s nothing to stop you trimming the extra length once the case is attached if they’re bothering you too much! And if you’re not keen on carrying locks around on your bike at all, (maybe there’s no room on your frame for a holder, or perhaps you don’t want to spoil the sleek silhouette of your bike! ), then there’s a new variation on the Foldylock called the Clipster, which does away with a carry case altogether (more details below). Weight wise, the Foldylock is very light when compared to other Sold Secure Silver bike locks. At 2.2 lb (1 kg), the only Sold Secure Silver locks that are lighter than the Foldylock are mini U-locks. (And of course, these mini U-locks provide considerably less internal locking space, which means you wont have as many options when you’re looking for somewhere to lock your bike). The light weight is also noticeable when compared to other folding locks. The Foldylock Compact is 7% lighter than the 3′ Abus Bordo 6000 (the given weights are not quite accurate: I weighed both locks with their cases). And 25% lighter than it’s big brother the Foldylock Classic (more on this lock at the bottom of the page). Folded up, the Foldylock Compact measures 7.5″ x 2.25″ x 1.5″ (19 x 6 x 4 cm). So it really is super compact when compared to any other kind of lock. But when compared to the 3′ Abus Bordo 6000, it’s about the same size. So this lightweight construction and incredibly compact folded form means that the Foldylock is much less effort to carry around than bigger, heavier locks. This will definitely be very noticeable if you attach it to your frame. And if you carry it a bag, it will be even more of a big deal! Compared to the 3′ Abus Bordo 6000, the Foldylock compact is just a little bit easier to carry around owing to it’s slightly lighter weight and the smoother case action that doesn’t require a strap to keep it place. How easy is the Foldylock to use? For me, this is where the Foldylock is considerably better than the Abus folding locks. The locks slips out of it’s case just a little easier than the Abus locks. But more significantly, the Foldylock is easier to unlock, maneuver and then re-lock. With the Abus lock, you need to unfold the middle links first and then yank the outer link downwards. The links are a little stiff and only being able to pull the outer link down vertically can be a bit cumbersome. With the Foldylock, the outer link is attached to the side of the locking mechanism which means it can be released and the lock can be unfolded in one motion. Once round your bike, it’s also easier to get the outer link back in the mechanism from the side. As well, the links move much more smoothly on the Foldylock which further improves the experience! The smoother movement of the links also makes the Foldylock a little easier to get around your bike and whatever you’re locking it to. However, in my experience, it tends to take a fair bit longer to secure your bike with a folding locks than a decent sized U-lock. Having said that, in awkward spaces (crowded bike racks) or around awkward objects (not bike racks) the flexible shape of folding locks can be a big advantage over U-locks allowing you to lock your bike in places that would be otherwise inaccessible! The Foldylock Compact is 33″ (85 cm) long. In practice, this gives you about 70 cm of internal locking space. It’s important to compare this to other types of locks, because people tend to think folding locks give you loads more space. In fact, the Foldylock gives you about the same internal space as an standard sized U-lock. The big difference is that it’s flexible space, so it’s a bit more accommodating. And compared to the Bordo 6000, you get a little less internal space, the Abus lock giving you around 75 cm. But don’t forget, the Abus lock a little heavier too. Like all decent locks, the lock itself and the case you carry it in are covered in plastic so they shouldn’t damage your paintwork. The Foldylock Compact seems to be an evolution of a previous lock called the Foldylock Classic (which is still available). The Classic looks the same as the Compact and works in exactly the same way. But it’s longer (95 cm), heavier (2.95 lb / 1.34 Kg) and significantly bulkier. So as you’d expect, the steel inside the links of the Classic is wider (22 mm, compared to 18 mm in the Compact). However, they’re also thinner (4.5 mm, compared to 5 mm in the Compact). In terms of security, this probably means there’s not much difference between them. And indeed, the Classic has the same Sold Secure Silver rating as the Compact. So how do you choose between them? Well, really it comes down to whether you need that extra length. While the Compact will give you 70 cm of internal space, the Classic will give you 80 cm. This is quite a lot for a folding lock. For example, it’s also 5 cm more than the 3′ Abus Bordo 6000 (see the picture above). It is slightly heavier than the Abus lock as well though. For me, there’s no contest. The Compact is significantly more, well compact! It’s also much lighter. And that makes a big difference when you’re carrying it about and even trying to get it round your bike. The 70 cm of internal space is more than enough for me in the vast majority of situations. Plus it’s cheaper! The Clipster: same lock, even easier to carry! Although the frame mount that comes with the Foldylock is one of the most convenient and dependable transport systems of any bike lock that I’ve tested, some people just don’t want to carry their lock on their frame! So for those people, the Foldylock is now available in a new variation called the Clipster. It’s exactly the same lock, but with the addition of a built-in clip that allows you to fasten the lock to your belt, pocket or bag for even easier carrying! I’ve tested the Clipster and it works really well. As long as you’ve got something to clip it to (I just use my belt), it will reduce the time spent locking and unlocking your bike even further. For more details check my mini review here. I’ve been using the Foldylock Compact for a couple of months now and I’m pretty impressed with the experience. Of course, that doesn’t mean it’s the right lock for you! So as always, to help you decide, here’s 3 things I like about the Foldylock and 1 thing I’m not so keen on. It’s very light, it’s very compact and it comes with a great case. If you’re able to mount it with your water bottle holder screws, then you’re going to struggle to find a lock that’s less effort to carry around. It’s not very long. But the flexible shape means you should be able to lock your bike in places that might otherwise be impossible with a rigid U-lock. A lot of thought has gone into the user experience with the Foldylock. The side locking mechanism and the smooth movement of the links mean that it’s much more pleasurable to use than other folding locks. The Foldylock is rated Sold Secure Silver which makes it a medium security lock for lower risk situations. Folding locks tend to be less secure than comparable U-locks since the bars are thinner (and only need to be cut once) and the pins can be susceptible to bolt cutters. However, Foldylock claims to have overcome the issue with the pins which would be a significant security improvement over other folding locks! It’s not to say that a medium security lock won’t give you enough protection! You just need to be aware that it’s not a lock for high risk circumstances. Find out how to assess your risk level here. After using it for a couple of months, I’ve become a big fan of the Foldylock Compact. It’s one of the easiest locks to carry around and use that I’ve ever owned. And it gives me loads of locking options when I’m locking for somewhere to leave my bike. It’s not high security. It’s not a lock for a super expensive bike that you leave unattended for long periods in a major city! But if you’re risk level is “lower” in my guide to finding the best bike lock, then this could well be the right lock for you. If you like the idea of a folding lock but think your risk level means you need something more secure, then at the moment there’s only one choice: the Abus Bordo 6500. The links are 0.5 mm thicker at 5.5 mm, it features Abus’ famous Granit locking cylinder and has been awarded a Gold security rating from Sold Secure. It offers about the same internal space as the Foldylock but at 3.48 lb (1.58 kg) it’s significantly heavier. It’s also not quite as easy to use. However, it’s a great lock. And since it’s the only folding lock that currently has a Sold Secure Gold rating, it’s pretty much the only choice! Read my hands on review of the Bordo 6000 here. Folding locks tend to me more expensive than U-locks; their construction is more complex, with many more moving parts. Also, the finish on the Foldylock is of a particularly high standard. So it’s not cheap. If it’s just too expensive for you, then a standard sized U-lock is probably your best bet. OnGuard make great value locks. And the OnGuard Bulldog is a really good value bike lock. But for reasonable price plus great usability, I’d always got for the Kryptonite Kryptolok Standard. It’s around the same security level as the OnGuard Bulldog (and the Foldylock). But the bent foot design makes it just a little easier to use. It’s definitely not as easy to transport as the Foldylock. And you won’t get the locking options that a folding lock gives you. But it offers about the same internal space as the Foldylock and it’s pretty easy to use. You can read my extensive hands on review of the Kryptonite Kryptolok Standard here. There are currently no bike locks that offer the same level of security and as much internal space as the Foldylock, while also being lighter. If you want to go lighter you’ll need to go smaller. The TiGr mini deserves a mention here, being the lightest Sold Secure Silver standard (it isn’t actually rated by Sold Secure but has 2/5 stars from ART which is about the same). But how about the Kryptonite Evolution LITE Mini 6? At 1.65 lb (0.74 kg) it’s significantly lighter than the Foldylock. 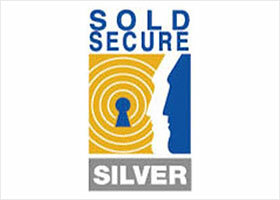 And it’s also been awarded a Silver rating from Sold Secure. For sure, this is a mini U-lock, measuring just 6.0″ x 2.75″ (15.3 x 7 cm). So the internal space is much smaller and offers fewer locking options. But it’s a great lock at a reasonable price and if weight is a priority you should definitely have a closer look at it.